Factions used to have an early victory rule, which provided a means for an arc to end ahead of schedule if one faction completely dominated. It was never actually used: Ionia came close to triggering it in Shon-Xan, but Noxus always beat it back in the victory tournaments. As Lines in the Sand began, I deleted that section from the Balance of Power page. We’re never going to need something like that, I thought. I had removed the early victory rules at the start of this arc because it just seemed like an awful idea. It’d be anticlimactic to just end the arc early, after all. This is especially true given that arcs are on the whole getting more complicated, with Nyroth representing the extreme version of the “complex arc”. I’ve often spoken in favor of the idea of balancing arcs by cashing in some of dominant factions’ matchpower for immediate story influence. For example, in Nyroth, we experimented with letting factions send Champions on lore events, risking that they might go MIA (sacrificing matchpower) to increase the odds of being able to shape the story as they intended (gaining story power). I plan to keep that in the new version of World Systems, though perhaps with a few modifications so that it doesn’t turn into an increasingly comedic succession of “let’s send Elise and Evelynn to die again” incidents. In Nyroth, we also experimented with breaking the arc up into phases, on a calendar basis. The arc started with a battle to become Valoran’s emissary to Nyroth, then moved toward control of the islands and then control of the mega-nexus at Yoroth, which held the key to Nyroth’s restoration; the arc finished with the ultimate prize of dominion over the Nyrothian mainland. While I think our structuring of Nyroth was a bit meh, I did like this overall approach, as it helped make the Balance of Power significant as something other than what we check at midnight on the last day of the arc to see who wins everything. This was also the rationale for the creation of World Systems during Hextech Revolution: a way to periodically use match results to divvy up smaller gains and losses. That’s something I want to retain in the new World Systems, by the way—I think the goal for World Systems should be a flavorful way to translate match outcomes into story developments as we move along, more than we should aim to create some totally separate Civilization game. With Shurima’s rather unprecedented dominance in this arc, it’s occurred to me that there’s a way to bring back a form of early victory while hitting at least, by my count, three birds with one stone. We might need a better name for this. But the basic idea here is that if at any point a faction manages to utterly dominate its competition, it will trigger a rebalancing, combined with a partial victory for that faction. (In theory, we’d also want a system for helping a faction that’s at rock bottom, but that’s a thornier issue, as we definitely don’t want to ever make it a good idea for a faction to tank its BoP standing to get buffed.) This adds a new “phase” into the arc in an organic, dynamic way, rather than on the Nyroth-style calendar basis. I think this will not only reward success and rebalance the system, but add some excitement to the arc’s storyline. That’s the hope, anyway. The discussion thread has been open for a while, as has a commentable GDoc. We’ve gathered some good ideas from those sources. I’ve decided to keep things real simple to start with. A faction qualifies for partial early victory if the following criteria are met. There must be at least one month left in the arc. The faction must be in first place. Why these particular numbers? Well, 50 points is the line beyond which the rubber-band factor stops increasing, and 100 points is a downright silly lead that warrants swift action. 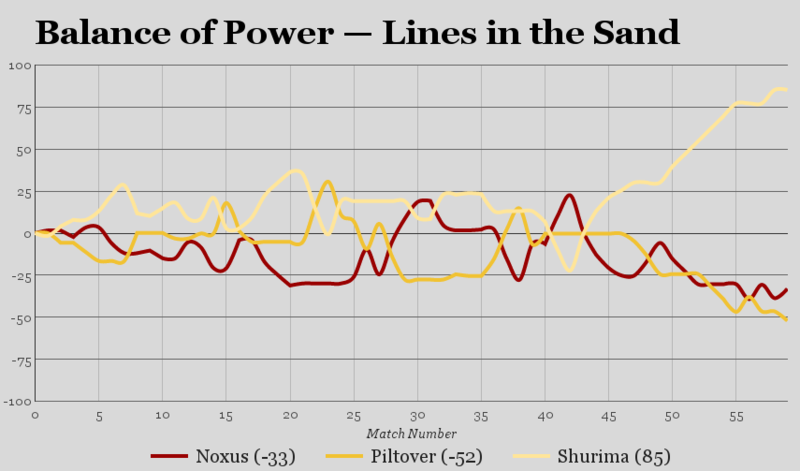 We can only make so many jokes about Shurima ascending off the Balance of Power charts. The faction scores a major story victory. To put a number on it, this win should amount to about a third of the overall stakes of the arc. In the inaugural Shuriman example, it means Shurima is admitted to the League as a sovereign member-state, rather than as someone’s protectorate or vassal-state. This means that, no matter what happens in the rest of the arc, the faction will come away with a major win. 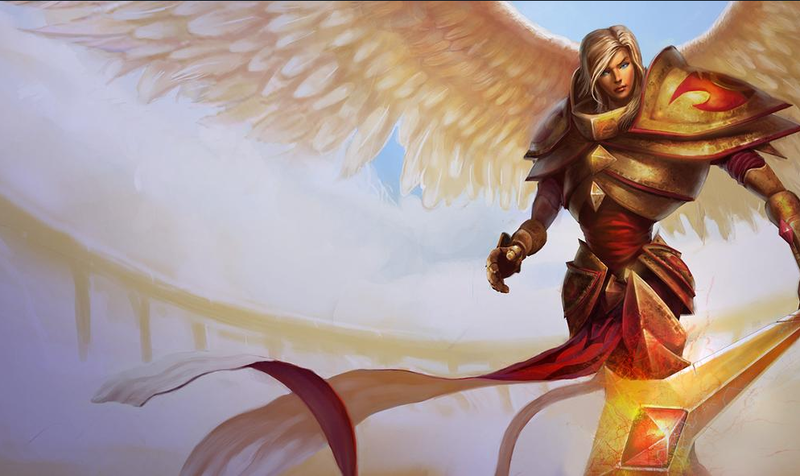 For example, no matter what else happens, Shurima will come out of this arc as a sovereign member-state of the League, with control over at least Azir’s resurrected capital. The faction also raises the ceiling on its ultimate arc stakes. The faction that won the early victory will be able to set its sights higher for the arc overall. In this arc, that means that, in addition to the boundaries of Shurima Desert, the new Shurima might be able to regain control of at least some of Shurima’s former principalities, like Mount Targon. The arc’s duration is also extended by one month. This is the part where I’ve really decided to pare down the various ideas to some core essentials. The faction that scored early victory loses its next two Champion pickups. Additional ban. They gain a second ban against the victorious faction. (The shielding still applies.) This is intended for factions who suspect that the faction that won early victory will remain the dominant force in the arc; it gives them extra matchpower against the victorious faction at the cost of not doing anything to help them deal with other factions. Reinforcements. The faction gains two additional pickups for itself. Useful if the faction believes it just needs to delve deeper into its Champion pool. These pickups are spaced out among separate weeks. Alliance. The faction can tag in an ally. (We will use a fairly generous definition of “ally”.) It will gain access to three Champions from that faction as Tertiary options. It must select one of these Champions with its next pickup opportunity, but this first allied pickup only consumes one pickup slot. (Tertiaries usually burn two.) It yields a third of its gains from the arc to the allied faction. (I’m thinking mostly of World Systems points here, though it also applies to more abstract story wins.) Strategically, this option is intended for factions that believe they really need to shake up the variety in their Champion pool to have a shot. It’s also a compromise implementation of one community idea, which was to let a losing faction just drop out entirely and tag in a new faction. The basic rules are effective immediately. We’ll give Piltover and Noxus their bonus option decisions with this week’s Champion recruitment vote; that bonus option will take effect afterwards. are you sure we can’t send Evelynn and Elise to die again? It MIGHT work! Answer: Elise and Evelynn. So yeah, might as well give it a shot. I”m going to note that Alliance is giving the losing factions story benefits which is what the winning faction is supposed to get. Additionally, the gain thing is also favorable for the faction since chances are they’ll be losing more than they’ll be gaining. There’s also the fact that it basically spits in the face of the rules developed for champion list and means the entire thing is irrelevant. Also, it isn’t “Shaking up” if it doesn’t remove any champions from their list. It also gives then an additional champion for no real reason. You’re right: the “and a third of its losses” provision was in effect a story gain, or at least protection from story losses. I’ve removed that provision. “There’s also the fact that it basically spits in the face of the rules developed for champion list and means the entire thing is irrelevant.” This part I don’t follow. It adds three Tertiaries and lets them recruit a single Champion at “half price” with their next available pickup. (Either this week or next week, depending on if they’ve just recruited a Tertiary.) I really do not think that makes Champion recruitment rules “irrelevant” or “spits” in their metaphorical face. “It also gives then an additional champion for no real reason.” Given how expensive it is to recruit Tertiaries, I don’t think that giving a faction three new Tertiary options alone would really hold up to the other two buff options. I think giving a faction three new options, and then letting them recruit one of them at half-price, makes it more of a favorable comparison. I was referring the the criteria of a champion being on a factions list, not the recruitment of said champion. Both Noxus and PIltover(mainly Piltover) are both already stretching those rules extremely far. Adding three more tertiary champions will basically break it because all the resonable champions are already on their lists. Shyvana/Jarvan on PIltover isn’t any better than Karma/Riven on PIltover. That’s the other thing, you haven’t even mentioned what these champions are which means it’s going to be rushed. WHich means it’s going to turn out horribly. Additionally, option one isn’t even a buff. It’s a nerf to Shurima. The other thing is that making it cost only a secondary gives half the benefit of Reinforcements, and it’s the same as the immediately benefit. Additionally, people generally prefer new choices so that alone gives it precedence, and I believe PIltover and Noxus were generally discontent with their current options. If you want to keep to need to up the take percentage to roughly half. Also, how will the narrative even be handled? In Hextech, the PIltover/Bandle thing was OK solely because both were active and one couldn’t use the other. Meanwhile here, all the options are going to be non-active. It’s basically stringing along another faction for almost pure benefit. Another thing, the default buff is “gain an additional champion on the unused Friday.” The three up there are described as options. So that’s straight up being divisive. You are also biasing it in favor of the losing factions since they get to pick how they want to be buffed whereas Shurima gets no option. As such the people supposedly winning have no agency while the losers have all of it. Either go with both defaults, or give Shurima the option of choosing which nerf they would rather take. Also to put it bluntly, “rewarding success” at the moment is akin to driving to the top of a mountain before other people, have someone congratulate you on what you already did, breaks two of your wheels and then gives nitro to the other two. Sad thing is you’re only a quarter of the way through the race and the major reward is still based on winning the race.